Her advice for other moms? "I would say, just take your prenatal." 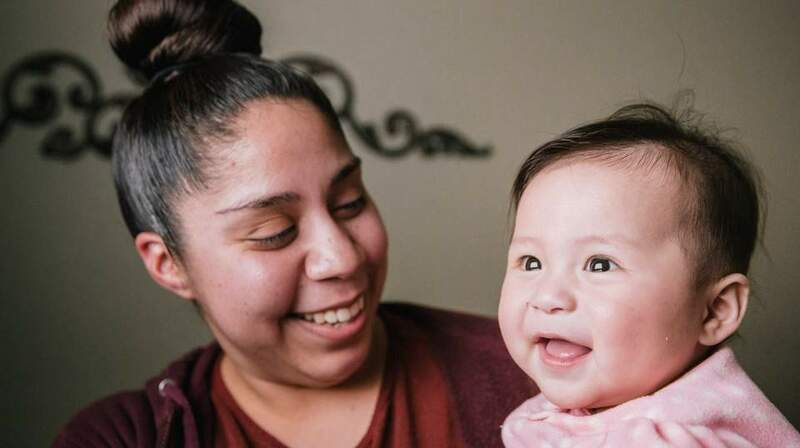 Jakelin, a mom from Arizona developed a strong bond with her daughter Hannah, even before she was born. The first time mother shared what it felt like to become a mom, "It was everything that you could feel. I was proud. I was joyful. I was in love. And I was scared too, but I knew that we would be okay. And I think it's seeing her so healthy and thriving, it's almost like I'm doing well, you know. I'm just so happy. I'm lucky to be her mom." Pregnancy came with its own set of worries, "I didn't have health insurance and I didn't have the funds to buy the vitamins that I needed, so I kind of felt guilty in the beginning just because she wasn't getting what she needed and I was kind of scared for when I would deliver her. Would she be nice and strong?" And with some sweet reassurances, "... when I was choosing her name, I was going through a bunch of different names. I was just saying them out loud and then when I said the name Hannah, she kicked, so I was like, maybe she liked that name. Every time someone would say her name and they were near her, she would move and squirm and kick so I think she picked her own name." The pair share a special connection that was clear from the very start. "So the first time that I held Hannah, it was such a loving moment. I couldn't believe how beautiful she was and she was mine. And she's just so precious. And it was instantly love at first sight. I know that's kind of weird, but that's how it was for me. I was in love and I kept telling her, 'I'm your mommy, I'm your mommy and you're my baby and we're gonna be together'." It's only natural to compare herself to others, but Jakelin stays focused on what is most important, "Even though I may not have the fancy stroller that all the other moms have at Target, or she doesn't have the modern H&M clothes. We don't need any of that because we have each other and we're alive and we're happy." Her advice for other moms? "I would say, just take your prenatal. I wish I would have taken my prenatal since the beginning. It definitely does help you as the mother carrying the child. The baby's taking so much from you and you need to be very strong. And also for the baby, you just want them to have everything that they need and taking that vitamin gives you that ease, that reassurance that, okay, they're getting it [what they need.]"